Read the fantastic summary report and complete report from the Structured Dialogue consultations from across Ireland through Young Voices! Check out the new Youth Goals which were developed as part of the last EU Youth Conf in Bulgaria! Read the fantastic summary report from the Structured Dialogue consultations from across Ireland through Young Voices! We asked participants in Ireland's Young Voices 'If you had to describe EU Youth Dialogue in one word what would it be?' Watch and find out...! Fourth and final meeting of the NIP will be held in the Gresham Hotel, Dublin on Saturday October 20th. Youth Goals and the EU Youth Conference. Our delegates Dan, Imelda and Dean carried with them the Young Voices of Ireland and while in Vienna worked with their peers from across Europe and indeed Youth Ministers including our own Minister Katherine Zappone TD who also made her way to Austria for this important event. The Youth Goals reflect the mutual vision of almost 50.000 young people for a better Europe. However, at the moment they are only written words on a piece of paper. And unless they lead to real actions, they are worthless. But who is responsible for the implementation of the Youth Goals: is it the European Commission? Is it national governments? The civil society? Or is it young people and youth organisations? The real answer to this question is; “all of the above”. The focus of the endeavours in Vienna centred around how the Youth Goals can come to life in our own national realities. Let’s see how the National Working Group and National Youth Council of Ireland respond to the challenges that our delegates will present on their return! Three meetings down and one to go! Over 150 young people have attended our NIP meetings so far this year and their work has brought us to a place where Young Voices has prioritised the issues of 'Resilience' and 'Mobility'. At our third meeting the young people in attendance worked very hard on developing a set of statements about each topic. At our final meeting on October 20th we will invite decision makers and experts to join us and contribute their own insights and expertise on these two issues with a view to considering what can be implemented at a National level to improve the lives of young people in terms of Resilience and Mobility. Come to the next NIP (National Implementation Project) on June 8th in Dublin! Consider applying to be an EU Youth Delegate and represent Ireland at the EU Youth Conference in September in Austria! Click above and read the fantastic summary report from the Structured Dialogue consultations from across Ireland through Young Voices! The National Implementation Project (NIP) will kick off on April 7th in the Gresham Hotel in Dublin. We are calling on all of those young people who were involved in Young Voices/Structured Dialogue activities that led to the following priority areas of focus. 2. Supporting young people to travel, in particular young refugees and undocumented young people. 3. Developing EU Youth festivals that combine social, cultural and political activities are a way of helping young people connect with Europe. 4. To be at its best, Youth Work needs sufficient funding. We invite you to join us and commit to the NIP in 2018! One year, four meetings, one mission! Click below for more info! Check out the Conversationz (YMCA Ireland) podcast from the previous Young Voices event! 3 Delegates from Ireland will travel to Sofia and represent the voices and ideas of young people from across the country. Click here for an application to be a delegate. Join Young Voices in Dublin on Saturday January 27th! Who: Young people 15-30yrs old who are interested in having their voice heard and getting involved in making positive change in Ireland and Europe! Why : Because this is about you and your voice matters! Deadline for Registration is Wednesday 24th. Click here to register https://youngvoiceseuyouthstrategyconsultation.eventbrite.com . You cannot attend without being registered and having a consent form filled in if under 18yrs . Under 18? You must fill out a consent form attached (or email youngvoices@nyci.ie for a copy) and then get filled out by a parent/guardian and scan/take picture and send to youngvoices@nyci.ie by Wednesday 24th January. Youth Workers attending with young people will be asked to remain with young people for the duration of the event. These conversations are part of an 18 month process which links with the EU Presidencies of Estonia, Bulgaria and Austria. Presentation to Children and Young People's Policy Consortium in the Dept of the Taoiseach. John Sutton, Valery Molay and Joe Munnelly presented the Youth Check story and proposal to the Minister for Children and Youth Affairs and the Children and Young Peoples Policy Consortium on Thursday September 28th. Click to see the wonderful report. Are you a young changemaker? Are you interested in becoming a changemaker? Would you like to develop new skills, ideas, attitudes, knowledge about how to make a better world at all levels, Personally, Locally, Nationally, Gobally?! Click the picture to apply for a place at the NYCI Changemakers Academy which is a residential training event on October 6th - 8th in Kippure Estate, Co. Wicklow. YOUTH IN EUROPE - WHAT NEXT? Pearse st. Library, Tuesday August 15th, 13.30 - 16.30. Young Voices are holding an event for young people aged 16yrs to 30yrs. Put yourself forward to be an EU Youth Conference delegate for Ireland and travel to Estonia in October. A hugely successful Conference was held in Pearse St. Library on Tuesday May 23rd. Our Young Voices group along with the Policy Innovation Unit of the Dept of Children and Youth Affairs joined our international partners from Belgium-Flanders, Austria and France to present their experiences of Youth Check to a diverse group of interested participants as well as important decision makers such as Senators Alice Mary Higgins and Fintan Warfield, Policy Officer in Leargas Pia Janning, Deirdre Twomey IHREC and TD Jim Daly who is Chair of the Oireachtas ctte on Children and Youth Affairs. The following day on May 24th a delegation form Young Voices along with our international partners attended a meeting in the Dept of Children and Youth Affairs to follow up the learning from the Conference and move towards a formal proposal for Youth Check in Ireland. Great event in the Gresham! Call for participants for Young Voices “Ideas to Action” event on 23rd Feb in Dublin City Centre. Join Young People from all over Ireland who want to be more involved in shaping society! Young People who want to have their voices heard! Young people who want to be part of deciding priority areas for youth. The National Youth Council of Ireland and the Department of Children and Youth Affairs are calling on policy makers and young people to participate in this event, part of the current European Structured Dialogue process that is taking place across Europe, giving young people 15-30yrs and youth organisations an opportunity to influence decisions affecting their lives. More Info? Contact youngvoices@nyci.ie for information and for consent forms for under 18 yrs to attend. YOUNG VOICES MEETING TO PLAN ACTIONS FOR 2017! Get involved!! Join other young people from all over Ireland at the Young Voices planning day in Dublin on January 28th. There are big issues on the table including, diversity, inclusion, vote@16, guidance counselling etc so we need YOU there to help us prioritise and plan for how we will tackle these issues on an Irish and European level in 2017. Click the link for more info and to sign up. Check out the wonderfully illustrated Young Voices Reports for 2016! What a story!! Tune in to the High Level EU Ministers debate 21/11/16 9am to find out what next for Structured Dialogue?! On November 3rd young people from all across Ireland who are passionate about making Europe a more diverse, inclusive and connected society gathered in Dublin. We spent the day looking at the Recommendations from the EU Youth Conference in Kosice and exploring what might be priority areas for Ireland. Next up we have the final EU Youth Conference of the current cycle of Structured Dialogue. Would you like to be a delegate and represent the young voices of Ireland? Click the link for the application. Young People Shaping a Diverse, Connected and Inclusive Europe! Eimear McNally produced this magnificent graphic recording of our day in Pearse St Library on July 28th where over 70 young people spent the day giving their views about the Europe they want. Our Structured Dialogue journey is in the CONSULTATION phase and like all young people across the EU we are discussing key questions about how Europe can be more diverse, connected and inclusive. The energy and passion in Pearse St Library was phenomenal and when we combine the wonderful diversity of young people in the room from all over Ireland and all walks of life we could really appreciate the richness of the feedback that will inform our report. Three delegates will be representing the young voices of Ireland in Slovakia in October. They will carry with them all of the feeback from our consultations as they connect with other young people and ministry representatives. We are very much looking forward to hearing about the recommendations that will come back from Slovakia and presenting them to young people at another big event in Dublin at the end of October. YOUTH CONSULTATION - HAVE YOUR SAY ON EUROPE!! Structured Dialogue Cycle V Consultations underway! Consultations have kicked off for the middle phase of this cycle of structured dialogue and we are asking young people and youth leaders/workers to give their views on the issues of "Diversity, Connectivity and Inclusion" in a changing Europe. Young Voices has been very active so far this year and there is so much more to come! Cycle V of the EU Structured Dialogue is well under way and we invited a group of 70 young people to an event in Pearse St. Library in March to begin our conversations about Diversity, Connectivity and Inclusion in Europe. Joined by Amel Yacef and her amazing team of youth facilitators we had a very productive day and some strong messages were sent to the EU Youth Conference in Amsterdam with our delegates Valery Molay, Joe Munnelly and Cárthach O'Faolain. Meanwhile our National Implementation Project (NIP) has been meeting every month to carry on the work of "Youth Empowerment for Political Participation". They recently had a fantastic opportunity to present the work of Young Voices to the Advisory Council of the Better Outcomes Brighter Futures (BOBF) National Policy Framework in the Dept of Children and Youth Affairs. Young Voices also had its first visit to the YSI Showcase event! We met so many inspirational young people who shared their views with us about why young voices are important! An event for Youth Workers and Youth Leaders to contribute to the current conversations about Diversity, Connectivity and Inclusion in Europe. We are going to hear a lot about 'Politics' in 2016. How much are we going to hear about 'young people' and politics? That is up to YOU! Join us on January 30th for the first of four meetings over five months to explore how we can influence policy makers on our recommendations for a better Ireland for young people. The final report for 2015 is now completed. If you would like a hard copy, please contact youngvoices@nyci.ie and we will send you one. Three young delegates who were selected following our July meeting in the Gresham Hotel in Dublin, are currently atttending the EU Youth Conference in Luxembourg. The three young people, Vanessa, Colm and Joe will be participating in workshops and plenary discussions along with representatives of the relevant Government Departments from EU countries and members of the European Youth Forum. On their return to Ireland we will write up the final recommendations relating to young people and political empowerment and we will begin the process of lobbying to make some real changes for young people in this area. The National Youth Council of Ireland and the DCYA ran an event for young people, aged 15-30 years, who want to be more involved in shaping society! On July 23rd 35 young people along with decision makers met in the Gresham Hotel in Dublin. The day was an opportunity for youth leaders/youth workers to share their views on Empowerment for Political Participation. 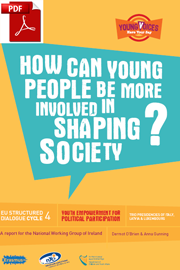 This is part of the current European Structured Dialogue process that is taking place across Europe, giving young people and youth organisations an opportunity to influence decisions affecting their lives. involving young people in decision making. The feedback from this consultation will form the basis for the Irish input to the EU Youth Conference in September in Luxembourg. 3 Young people from this event were selected to represent Ireland at the EU Youth Conference in Luxembourg in September. The three young people are: Vanessa Mulhall, Joseph Munnelly and Colm O'Rourke. This is part of the current European Structured Dialogue process that is taking place across Europe, giving young people 15-30yrs and youth organisations an opportunity to influence decisions affecting their lives. Youth Empowerment for Political Participation – ‘Ideas to Action’ event. On Saturday April 25th, 30 people attended a meeting in the Gresham Hotel in Dublin to discuss and debate the recommendations from the EU Youth Conference as to how we can empower young people and improve political participation in Ireland. Recommendations were made around how to involve more young people in decision making processes and how to engage more young people in dialogue with policy makers. The findings from the day were then reported on to the Minister for Children and Youth Affairs in advance of his Policy Meeting in Brussels with other Youth Ministers from around Europe. We are now planning a follow up event to progress these recommendations further and to try to effect real change in this area for young people in Ireland. How can young people be more involved in shaping society? Young people across Europe are having important conversations about Youth Empowerment and Politicial Participation in 2015. Download Report: "Youth Empowerment in Ireland". Is "Politics" just about Politicians OR is it about People too?! Young People in particular! "Stimulating a culture of participation in education"
"increasing trust and understanding between young people and decision makers"
"young people and youth organisations being fully involved in shaping policies together"
"the role of Youth Work to empower young people"
"how we can include everyone and use new technologies!" As an individual or part of a youth group you can log on to the Irish Online Participation Platform and share your thoughts on the topics mentioned above. You may also be involved in a Focus Group meeting facilitated by our Structured Dialogue Project Officer. Ultimately you can be involved in deciding what messages Ireland will be sending to the EU Youth Conference in Latvia this March. Download the Flyer and Poster below for more info!